Patricia Sloane's study is a detailed reassessment of two of the poet's most provocative works that examine Eliot's allusions and larger purpose. 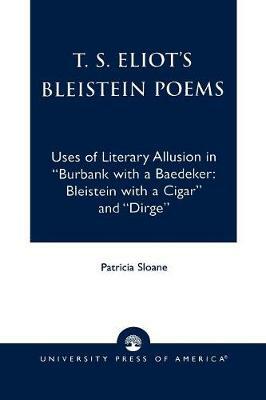 In this close reading of the two poems in which Bleistein appears, Sloane shows that Burbank is an intricate derivation of Dante's Inferno. The book also includes a general introduction to Eliot's use of literary sources and to the introduction of the five poems.